Sanctuary, reserve, marine park, MPA (marine protected area), it’s all the same, but not exactly. People use these terms somewhat interchangeably, so let me explain. MPA is kind of a catch-all term that includes all of these other terms and is what academics often use. They all have the same concept though; to protect a certain habitat (wetlands, beaches, or open water) by establishing limits on what you can do or take there. It’s just like what most people call a “park”. But you know how “parks” can be just a corner lot with a playground, but they can also be something like Yellowstone? Marine parks are like that. Even in the U.S. we have to use multiple names to describe the same idea. National Parks usually refers to land. But we also have National Marine Sanctuaries, which obviously refers to water. Then if you want to protect an estuary (where the river meets the sea) you usually have to call it a Wetlands Reserve. Confusing, yes. They are also all run by different government agencies, but that’s another mess of a topic. The MPA most people know best is the Great Barrier Reef Marine Park (GBR). What I didn’t realize, even when I was snorkeling there, was that you can actually go fishing on the GBR! I always thought it was just the conservation attitude of the Australians that allowed for this enormous area to be protected just for snorkeling and diving. It is actually zoned, just like a city zones business and residential areas. There is an aerial map of the GBR that shows the zones for fishing, or for tourism, or for shipping lanes. Some MPAs don’t have multiple zones, they just have one zone. Like in Maite, my study site. Sorry for the confusing terms; I call it an MPA, but I sometimes also call it a sanctuary, because that is what the local name for it is- “Maite Marine Sanctuary”. All sanctuaries are MPAs, but not all MPAs are sanctuaries, get it? There is a buoy line extending out from the beach that marks off a rectangle of water. No fishing or collection of sea shells or urchins is allowed. But snorkeling, diving, and swimming are allowed. Just like a park entrance, there is a “user fee” associated with each of these activities; you can pay about 50 cents to swim, $1.25 to snorkel, or $2.50 for a dive. 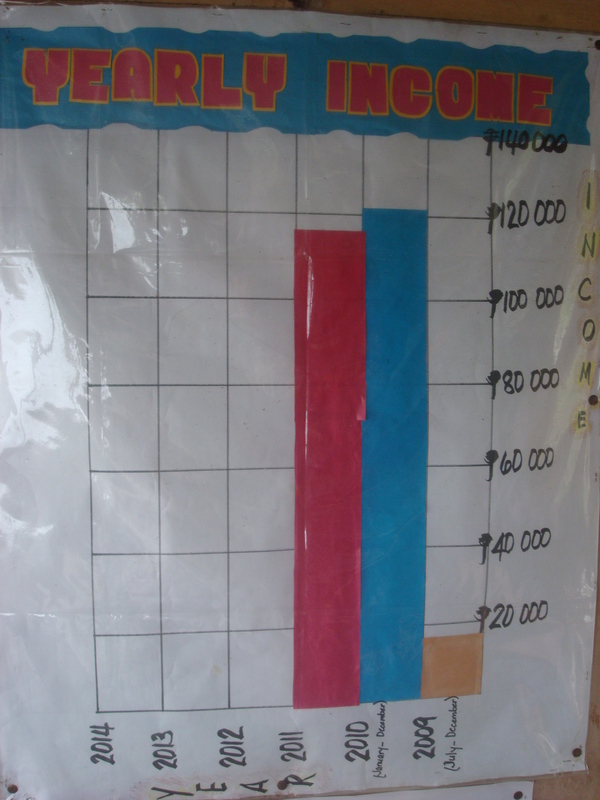 This money is the only income the community gets from the MPA. 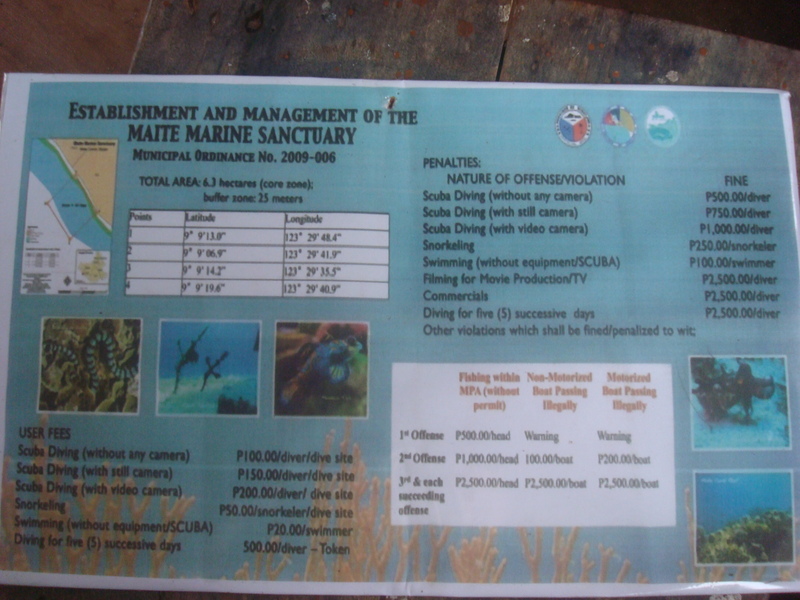 The community has earned 250,000 pesos through user fees since the establishment of this MPA in 2009. In just 3 years, that is almost $6,000 USD. Just pocket change for the foreigner who loves to scuba dive adds up to something really good for this community. Maybe the tourists don’t really see the purpose on the fee, or they don’t see how much this pocket change does, but I wish they did, because I think it would be a powerful message that would inspire a few extra donations. The income gets divided though. First they pay off the maintenance costs. Then 40% goes to the municipal government. The remaining 60% gets divided between all 3 parts of the management team. 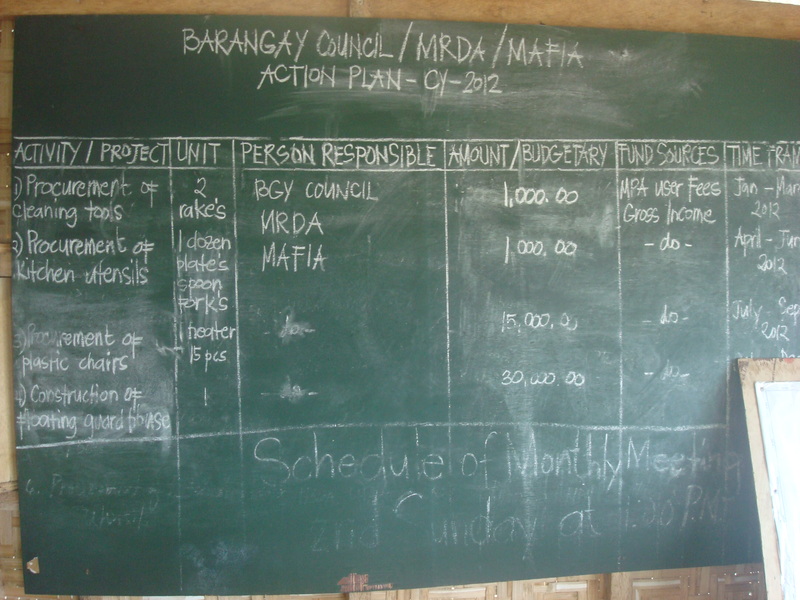 20% goes to the barangay council (like the town council), 20% goes to MRDA (the women’s group), and 20% goes to MAFIA (the men’s fishing association). One of the things MRDA does with this money is re-invest in its members. They offer a 500 peso loan at 5% interest to the members only. 500 pesos is only about $12 USD. It doesn’t sound like much, but it is enough for some of the women to run small businesses. They might buy raw materials, like dry goods or fresh fruit, and then make snacks they can sell on the side of the road or at the local school. Maybe this doesn’t sound like a big deal, but a $12 loan is a big deal. According to Siason (2001), women in the Philippines are not recognized as borrowers, and often have to borrow loans informally through family and friends. According to a World Bank study on how people spend their income, this is another really important part of the puzzle. It said that women re-invest 90% of their cash income into their family and their children. And men put 15% of their income towards the family. Now maybe you can see why we learn so much from separating the statistics on men and women. At a large scale, this has already been applied in a few arenas. Microfinance in India is focused on women, for the factors like how reliable they are on paying back loans. In a place where people sometimes don’t have enough food on the table for full meals, malnutrition is a major public health concern. There is literature indicating that when there’s not enough food on the table, the woman is more likely than the man to skip a meal and give that food to her children. After the earthquake in Haiti, food vouchers were only distributed to women (see blog link below). I’ll be looking forward to Danika Kleiber’s results from her study on these issues in the Philippines. Back to the MPA- that small user fee not only provides incentive for environmental protection, it can contribute to women’s empowerment through small business and better nutrition for families. Sounds like a small price to pay for snorkeling in a sanctuary, doesn’t it?